Arthur really wants his own puppy. So he starts his own "Pet Business" to make a profit and to prove his responsibility to his parents. Interested in using this resource in your classroom? Check out the posters that go along with this book: Profit, Human Resources, Supply and Demand, Entrepreneur. Why did Arthur need a job? To show responsibility to his parents, to get a puppy, to earn money to repay his sister, D.W. List his choices of possible jobs. What did Arthur think of doing that he knew he would enjoy? 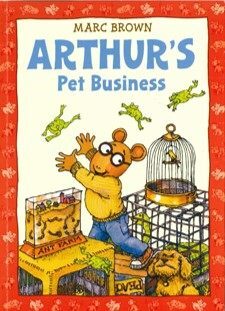 What other advantage did running a Pet Business have for Arthur? It gave him the opportunity to practice taking care of pets, increasing the likelihood that his parents would let him have a pet. How did Arthur let people know about (i.e. increase the demand for) his business? He advertised by putting up signs. Identify Arthur's personal costs in running a business. His costs were mainly the costs of his time - his own human resources. He had to work long hours and had a lot of responsibility. This created a lot of stress and exhaustion in his life. What risks were involved in Arthur's business? Dangerous pets, losing the pets, destroying his mother's house. He earned ten dollars and the privilege to have his own puppy. How did he spend the money he earned from his business? He paid back the seven dollars that he owed his sister. No! Many businesses do not make profits at all. They actually lose money and eventually have to close down. There is always a risk when you start a business - you never know for sure if you will make a profit.